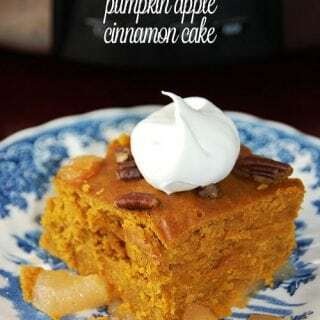 Slow Cooker Pumpkin Apple Cinnamon Cake - Recipes That Crock! In the mood for an amazing dessert? You have to try this Slow Cooker Pumpkin Apple Cinnamon Cake from 101 Super-Easy Slow-Cooker Recipes! The pumpkin/apple/cinnamon combination is ah-mazing! Top that off with some whip topping and you have an instant family favorite! This recipe was super simple to throw together too. I used to be pretty afraid of making a cake from scratch. I mean…it is making a cake from scratch! My first attempt at a from-scratch cake was a family favorite recipe – Texas Sheet Cake. I took it to a church function and had rave reviews. So I tried another recipe and another and now I realize that there a ton of from-scratch recipes that aren’t hard at all! 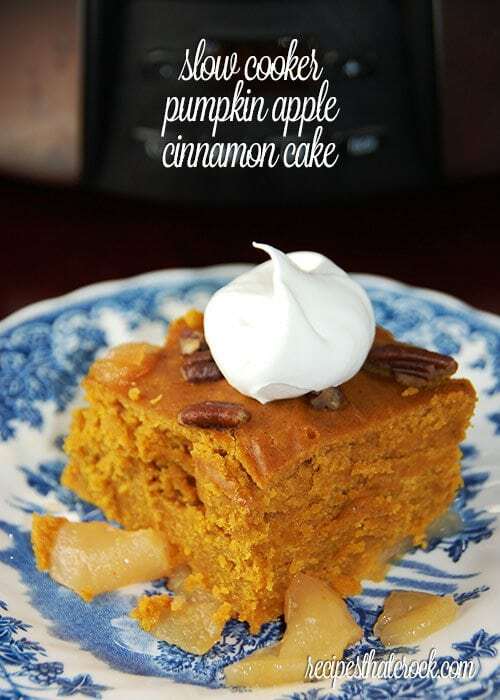 This Slow Cooker Pumpkin Apple Cinnamon Cake is one of them! If you happen to forget to put your butter out to soften, check out the tip in this recipe. Mix together your butter and brown sugar with an electric mixer on low. Once that is well blended, add your pumpkin and egg and beat until it is all mixed together. Grab another bowl and sift together your flour, baking powder, baking soda, cinnamon and salt. Add your flour mixture to your butter mixture slowly and beat for approximately 2 minutes. Spray your slow cooker with a non-stick cooking spray. Spread your apple pie filling evenly in the bottom of your slow cooker. Pour your cake batter over your pie filling and sprinkle with nuts. Cover and cook on high for around 1-1/2 hours. It is done when it can pass the toothpick test. Serve it up with a dollop of whipped topping and enjoy! Serve it up with a dollop of whipped topping and enjoy.